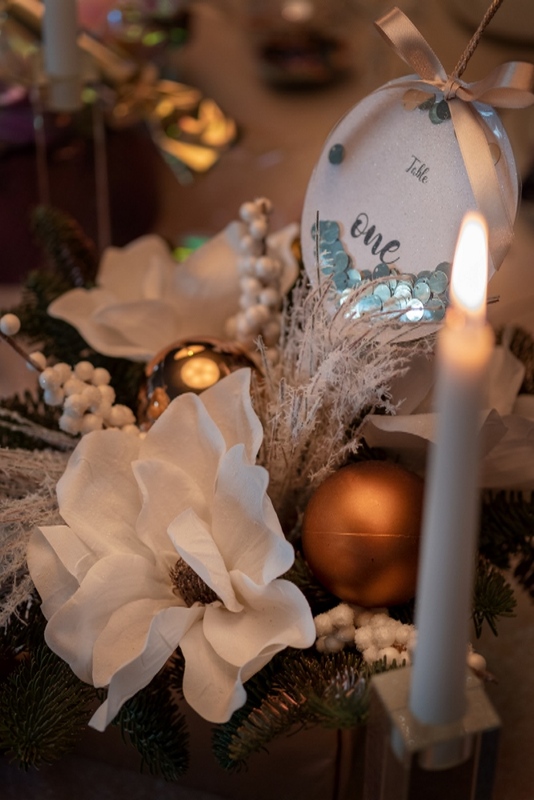 As it is everyone’s favorite festive holiday of the year, we can’t deny that it’s our favorite time of year to plan, design and decorate events in Greece! After all, everyone knows ‘it’s the most wonderful time of the year!’. 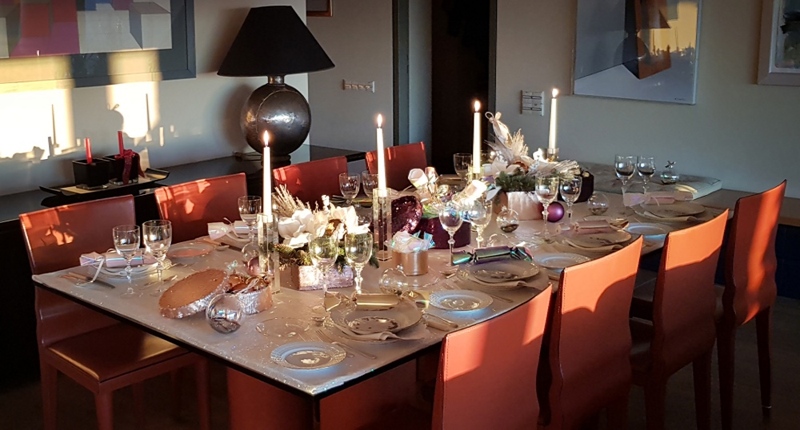 We were thrilled to plan a Christmas dinner party for Boxing Day in the northern suburbs of Athens for our South African hosts, Andrew and Claire. A super modern yet homely space with an amazing panoramic view overlooking Athens with a beautiful sunset and the sea in the distance. This was a home filled with hospitality and warmth, the perfect setting for a festive dinner party. 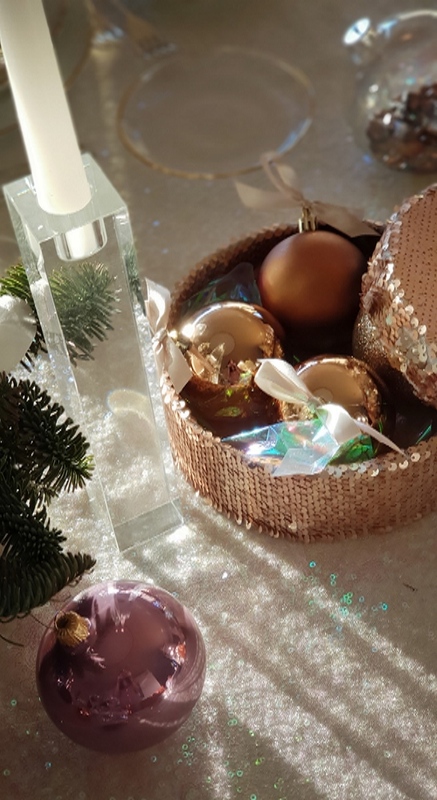 Joy and sparkle were the two words that popped up in our minds when we thought of Christmas celebrations and we couldn’t help but get ‘distracted’, or rather, inspired, with the latest trend of Iridescent shades, especially since it is the season to sparkle! 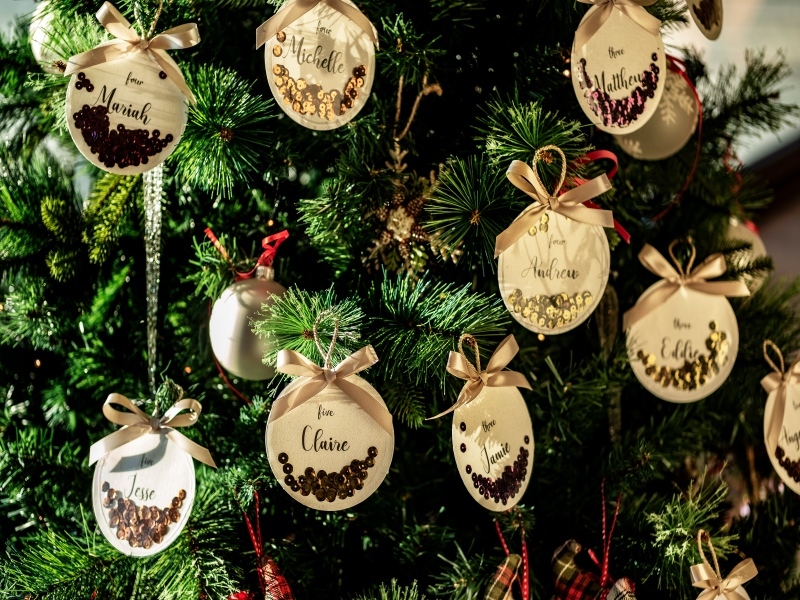 Color emits Joy and Shimmer; Shine and Sparkles radiate Celebration – the ideal combos for a Christmas party! This December we love sequins, glitter and opal sheers, with a finishing touch of Pantone Color of the Year – ultra violet purple, to warmly end 2018, of course with iridescent flair to steal the show! Setting out the dinnerware gave us a warm feeling as this time of year, is always about family and loved ones. 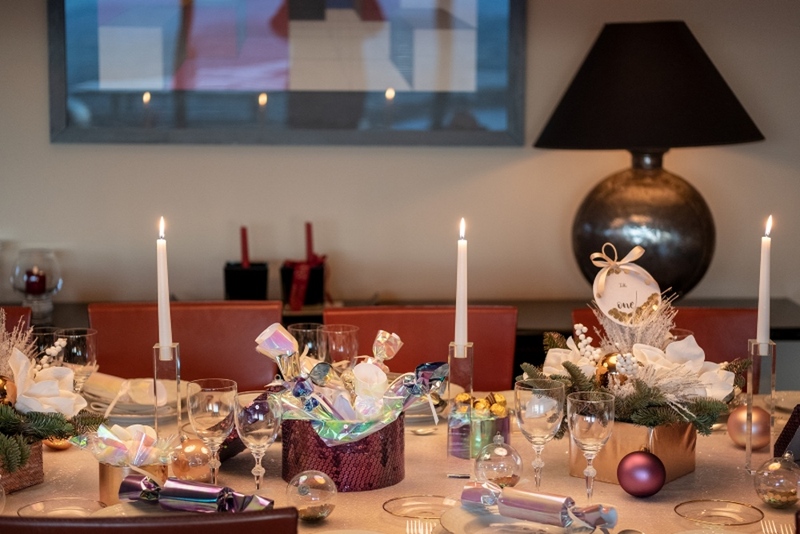 Every year, Claire brings out her grandmother’s vintage tableware for sentimental reasons to remind herself of her past Christmases in South Africa. 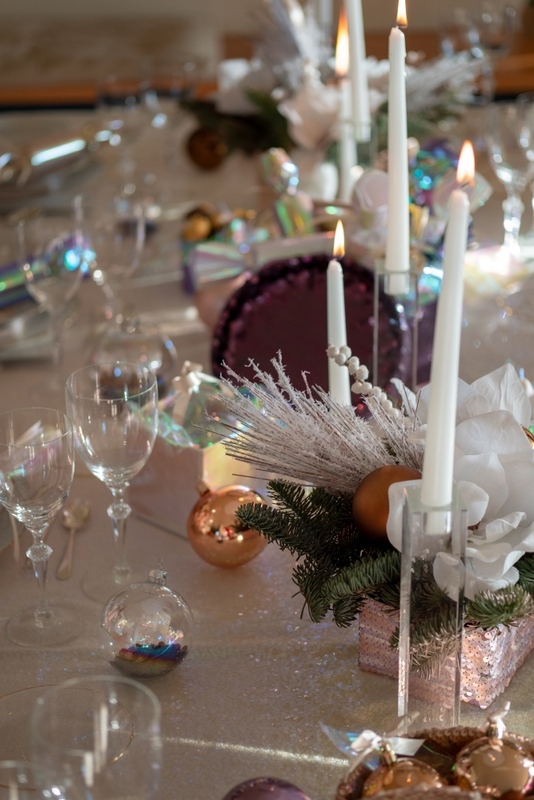 The lovely fine bone china, gold rimmed tableware and crystal glassware were all carefully placed on long white iridescent sequined fabrics which covered the tabletops. 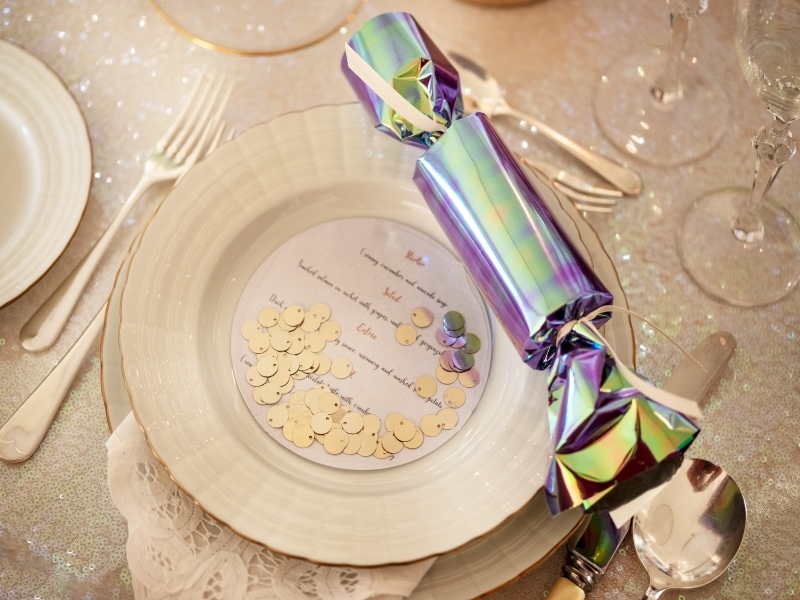 Staying true to the fun Christmas tradition, each guest’s dinner plate held handmade crackers which were made with purple, gold, white and rose gold, lustrous wrappings. 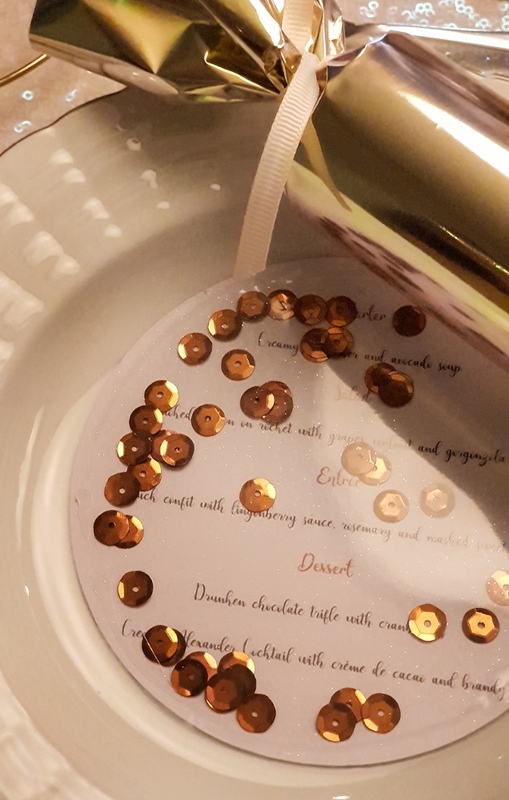 Accompanied, were individual handmade menus resembling glass ball designs, dusted with glitter together with a playful touch of loose sequins for guests to shuffle while reading the menu. 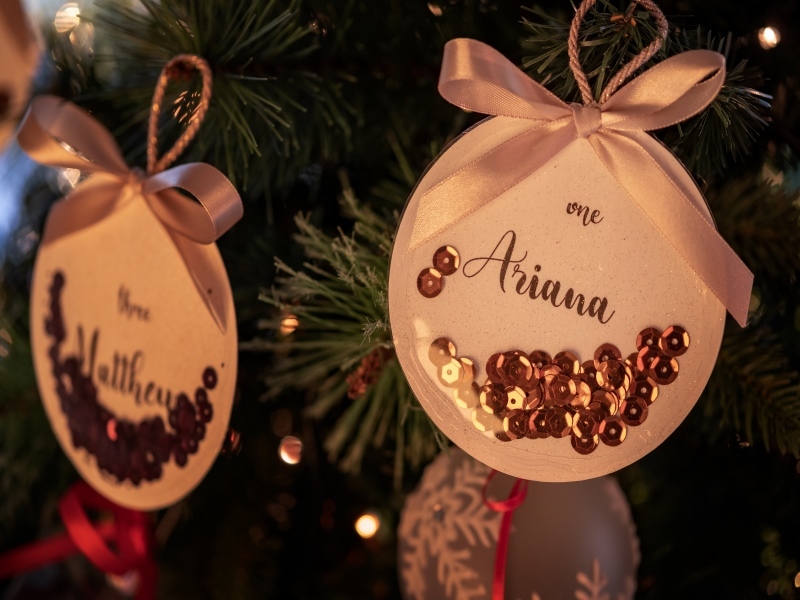 The same idea followed for the seating arrangements- name cards, hung from the Christmas tree like decorative glass balls. 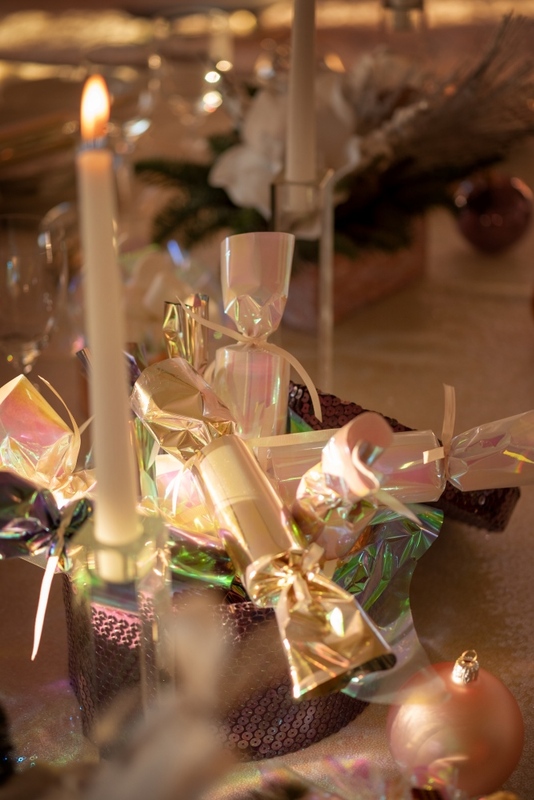 The dinner tables were beautifully decorated with handcrafted ‘gift’ boxes for centrepieces which were inspired by the name Boxing Day. 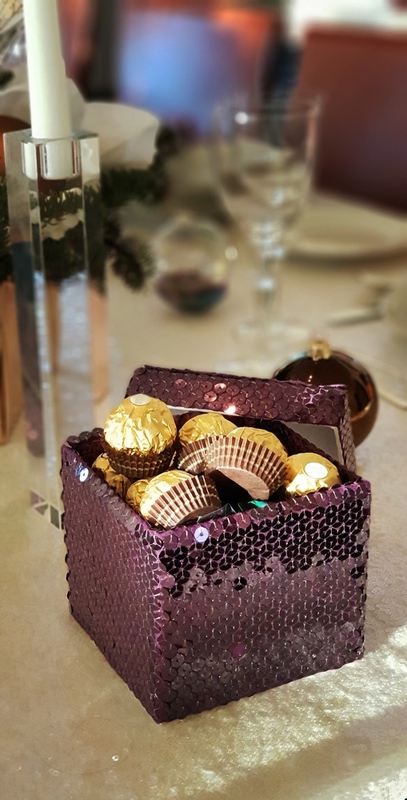 These ‘gift’ boxes were made with the latest fashion items which we simply love, such as sequins, metallic paper, shimmering fabrics and iridescent paper which we elegantly wrapped and filled with chocolates, marshmallows and fresh flower arrangements. Tall white candles were placed in tall minimal crystal stands between the centrepieces. 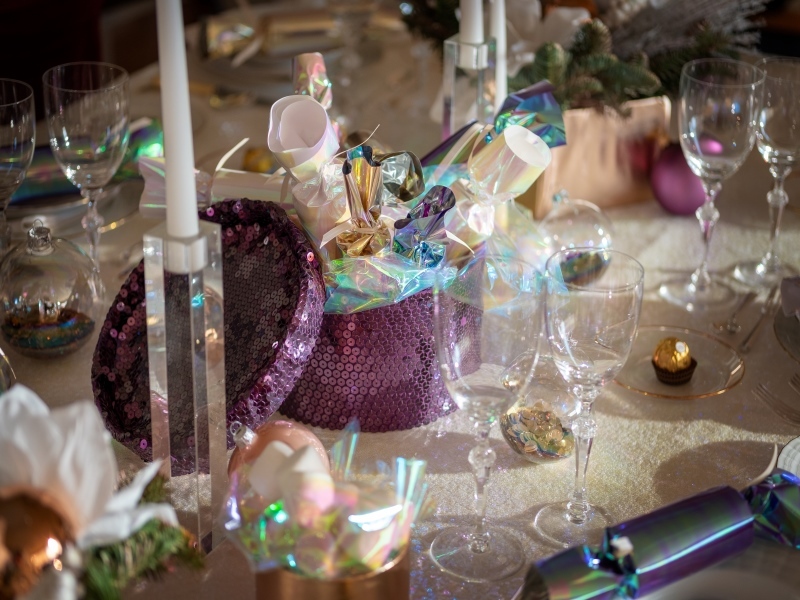 Scattered around the dinner tables, lay various opal sheer glass balls, as well as rainbow-like glass balls filled with sequins, for an extra and touch of glam. The iridescent hues were ever-changing according to the rays of sunlight, together with the warm light from the lit candles, making the dinner tables look truly fairy-tale-ish and magical! It was a fun experience for us as it was for Andrew & Claire. Live piano music played as the guests arrived. We could only feel that this was the beginning to a very beautiful and festive evening! LET'S PLAN YOUR BIG DAY, STRESS FREE! SIGN UP FOR MONTHLY TIPS AND ADVICE! Website Consulting & Content Curation by Codico Lab | Web Development by United Online S.A.